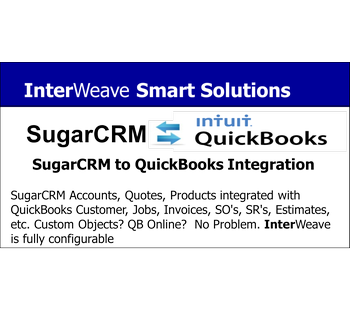 SugarCRM QuickBooks Configurable Integration Solution SugarCRM, Inc.
InterWeave SMART Solutions deliver powerful yet easy-to-use configurable integration Solutions for SugarCRM customers, allowing seamless integration of data from SugarCRM to QuickBooks Desktop and Online. Running multiple applications that have specific integration needs, but minimal IT support, is a daily reality for all size business owners today. We have a solution for you – InterWeave Smart Solutions. Why buy a widget when you can have the whole Solution? 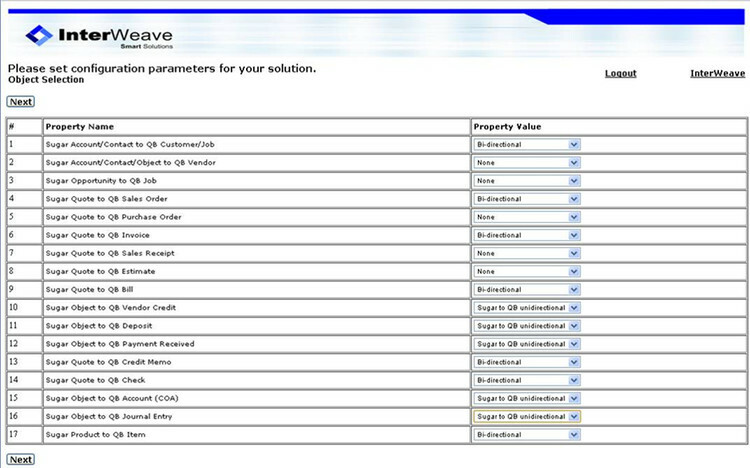 InterWeave Smart Solutions deliver a complete integration process for popular business applications. Let’s look at a favorite, SugarCRM.com and QuickBooks. Introducing InterWeave SmartSupport Programs SMART+ Support SMART+ Support Plan connects you with resources to achieve and expand your success with InterWeave. Our Help site and SMART+ Resources provide best practices, templates, videos and more.